Kay Blandford has shared barrel racing’s best kept secret! 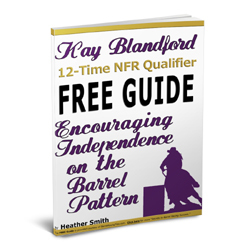 I’ve worked together with 12-Time NFR Qualifier, Kay Blandford to develop a FREE Guide that could quiet possibly fill the gap standing between you and your barrel racing dreams. I’ll be honest – I ran barrels competitively for over a decade before the light bulb came on. Kay Blandford has understood the concept for years. After all, one doesn’t qualify for 12 National Finals Rodeos over the course of FOUR decades without this knowledge. But like mine was, your program could be missing what could very well be considered barrel racing’s best kept secret. • Help your horse take more responsibility, making your job as a jockey much easier. • Develop a heightened level of awareness as you learn how to “test” your horse and rate his current level of competency. • Gain confidence and consistency when you understand Kay’s “less is more” approach. I’ve been an avid and dedicated student of horsemanship and barrel racing all my life and not once had I seen this subject covered. What really separates this unique FREE guide from any other resources, is that it’s presented in a way that is very palatable. So although the ideas are far from being “common knowledge,” they are easy (maybe too easy!) to understand and apply immediately. Although we’re ALL riding to win, so much more can be gained when we support each other as a community. Here at BarrelRacingTips.com I’m all about sharing and openness. This web site is my way of paying it forward – and I sincerely hope you’ll take advantage of this FREE guide and that the concepts will open doors for you as they have for me. Just enter your name and email address below, click on the “Count Me In” button, and I’ll send you the guide via email ASAP. As an added BONUS, you’ll also receive my special, weekly barrel racing tips (ONLY available via email) when new, results-generating content is posted – it’s FREE! Oh, and don’t worry – your information is safe with me. You can be sure I will never sell, share, rent, or give away your information to anyone for any reason. I look forward to connecting and delivering one of a kind tips to your inbox each week!